Kristen Cibula is a friendly and outgoing 20 year old from Beaverton who enjoys riding horses, working out at the local gym while watching “Let’s Make A Deal” and sharing movies with her friends. Like many young adults she wanted to find her first job out of High School so she could become more independent and perhaps someday have a place of her own. 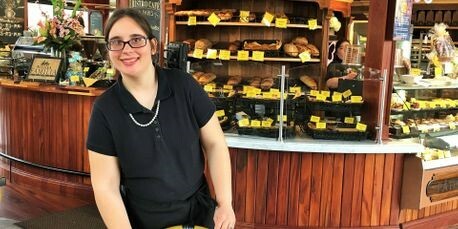 However unlike most, Kristen has a developmental disability making her goal a bit more challenging than just submitting an on-line application as many employers want today. Through the Beaverton School District, Kristen participated in the Community Transition Program and was introduced by The State of Oregon, Department of Vocational Rehabilitation to Dirkse Counseling and Consulting, Inc. to help her reach her career goals. Together they determined her cheerful personality and ability to learn and follow directions would be an asset in the customer service industry. In September of 2016, the Dirkse CC team found the perfect spot at a local favorite; La Provence Boulangerie and Patisserie at Progress Ridge Town Square. La Provence has obtained such popularity in the area due to its excellent service and exceptional breakfasts, lunches and dinners that feature pastries, desserts and breads they make fresh each day. At any given time, tables are packed and orders are flying with servers and crew running almost literally to fill their customer’s orders quickly and efficiently. The restaurant is managed by General Manager Sarah Hanks who was open to giving Kristen an opportunity to be a part of her team. Over the past 6.5 months Kristen has learned her tasks of preparing silverware and setting and bussing tables with the support from Job Coaches at Dirkse CC. Ms. Hanks shared; “The entire staff enjoys working with Kristen, it’s a pleasure to see everyone coming together.” Kristen is always eager to learn new tasks and is frequently heard telling customers “have a nice day” and “thank you, come again” as they happily leave the restaurant with full bellies and a smile. Since working with Dirkse, The Barbers has hired 3 successful sign holders for various locations throughout the Portland Metro area and we plan to hire more as the opportunities present themselves. The job placement team is prompt, courteous and they make it extremely easy for an employer from a logistics perspective. The employees have been timely, professional and hardworking.